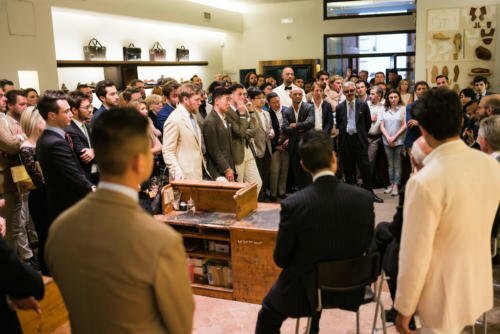 Just like the Shoemakers Symposium we ran in January, the biggest pleasure of our Tailors Symposium at Pitti this week was bringing together wonderful, talented people. The format for the Symposium was again similar to January. 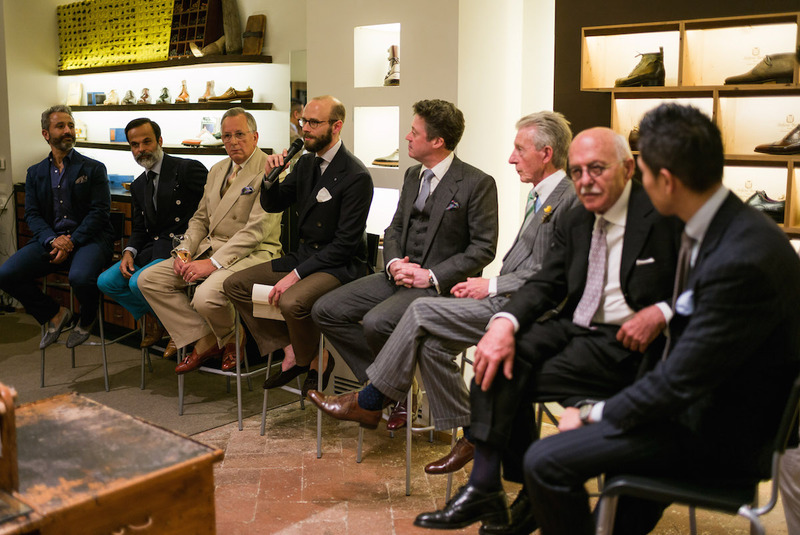 An audience of our favourite buyers, brands and friends, and six of the greats on high stools, answering my (almost) deliberately naive questions. The difference was that before we went to general questions about the industry, I introduced each tailor’s style, and they then explained it in detail to the audience, using a young colleague or customer as an example. 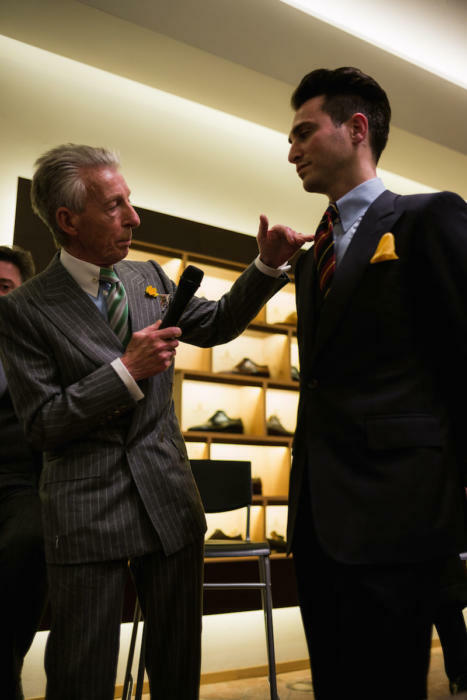 We deliberately picked the six tailors because of their mastery of six distinct styles: the drape of Anderson & Sheppard, the structure of Richard Anderson, the seventies flair of Edward Sexton, the rope of Cifonelli, the clean curve of Liverano, and the eternal lightness of Panico. First up was John Hitchcock of Anderson & Sheppard (now retired, but still working on projects like this) who demonstrated the drape style on trouser cutter Oliver, who was wearing a peak-lapelled single-breasted A&S suit. Oliver did his job manfully, and Mr Hitchcock similarly, even if the microphone was a bit of a struggle. 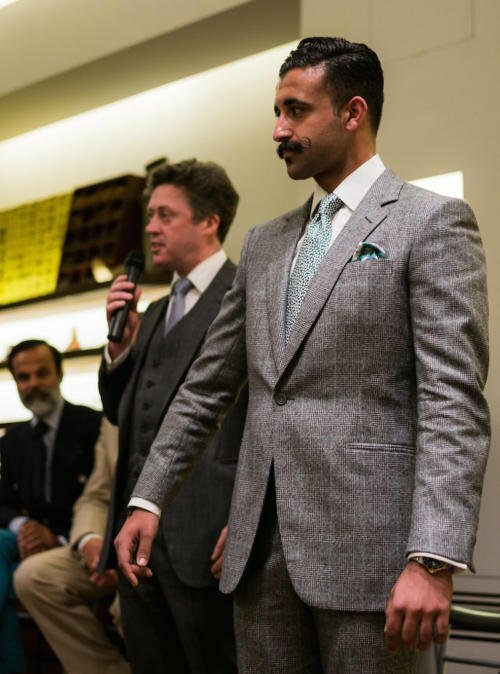 Richard Anderson walked us through his structured cut, derived from the old English hunting jacket, using Krishan as his model. 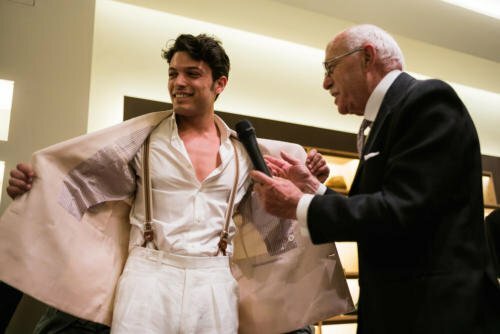 One of the nice things about the tailors was that I could introduce each personally with my experiences and reflections on the cut, in this case the dinner jacket Richard made for me a few years ago. 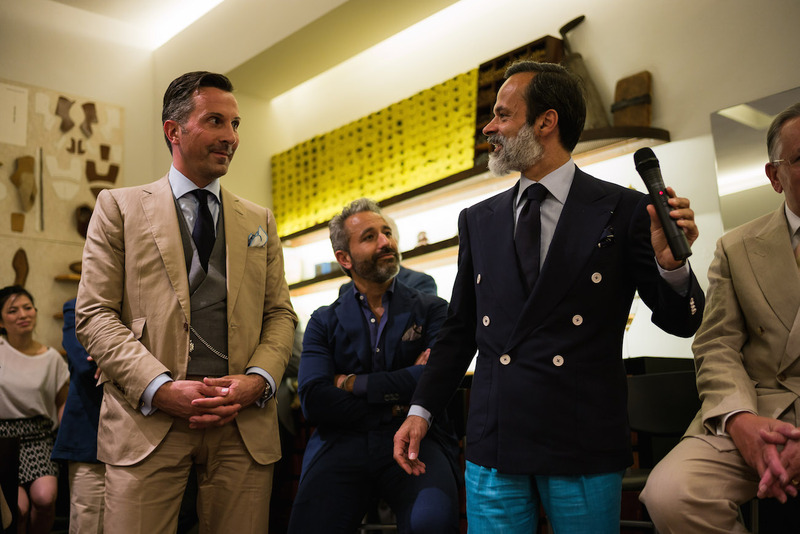 Lorenzo Cifonelli explained the house rope shoulder and lightweight canvas, clean chest and typical Parisian finishing, with Romain and Alexander Kraft both taking turns as models. 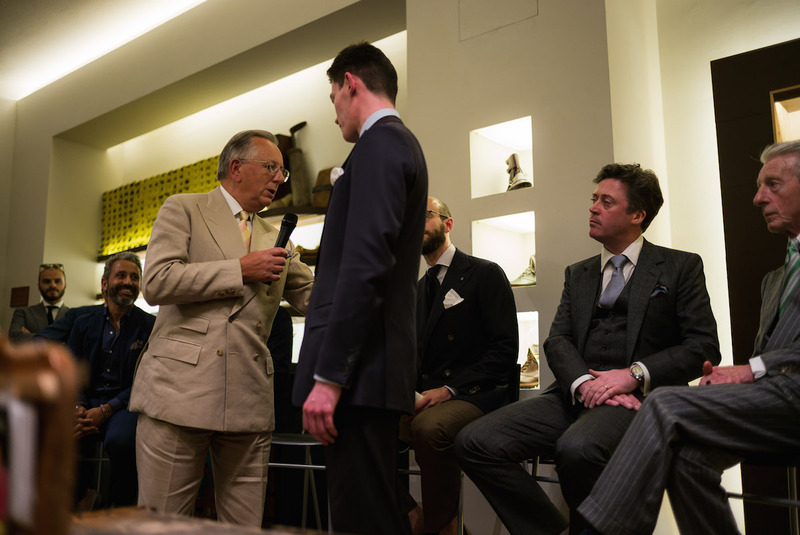 I was interested to hear many people – often from tailoring houses themselves – saying the nicest thing about the evening was seeing such styles demonstrated, rather than just talked about. Others from the industry – cloth merchants, retailers, manufacturers – said the same thing. Edward Sexton was fantastic in his explanation of his style. 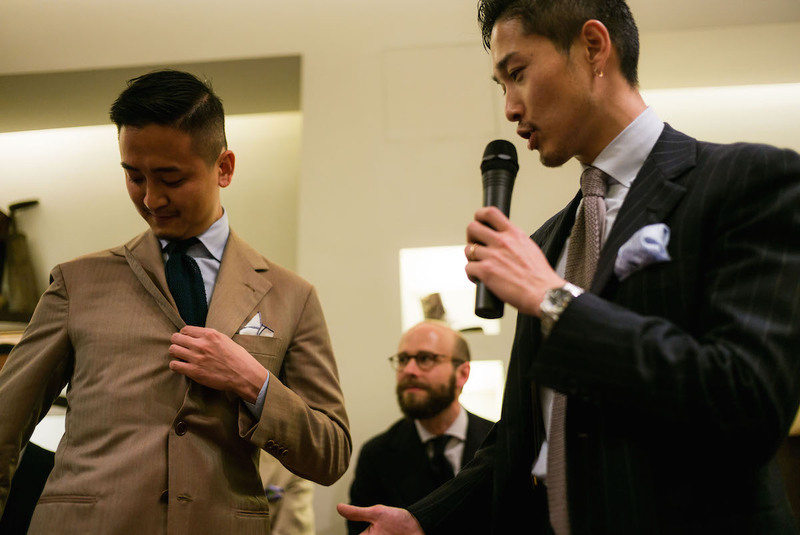 “It’s all about shoulders, collar and lapels – that’s what hits you when someone walks in the room,” he said. 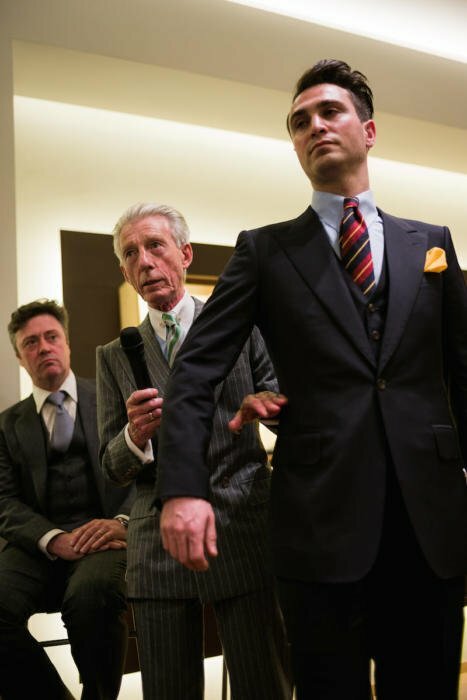 Interestingly, Edward also noted (while pointing things out on Dominic) that he was inspired by 1940s suits when he first started. “We used to watch all the old films, Fred Astaire and so on, and then try and recreate the suits but with our own touches or styles.” Interesting to know if anyone is looking at Edward’s today and putting their own tweaks on the style he established. Antonio Panico was wonderfully expressive in his slot, declaring that he preferred people to see and wear the Neapolitan cut rather than try and explain it in words. So he showed it to us, scrunching up the DB jacket and then undoing it to show the lightness of the construction. And lastly Taka stepped in for Antonio Liverano, who wasn’t feeling well after the hours of coverage we had already done, and demonstrated the Liverano style on Alan See. Amid calls of “where can people buy it Alan?” from the Armoury guys in the audience, Taka talked about the broad Liverano lapel, the shorter length and the rounded, open foreparts. Those hours of coverage earlier, by the way, were for a feature The Rake is putting together on our symposium, and a video they are producing. So don’t worry, there will be some video coverage – if not of this discussion itself. 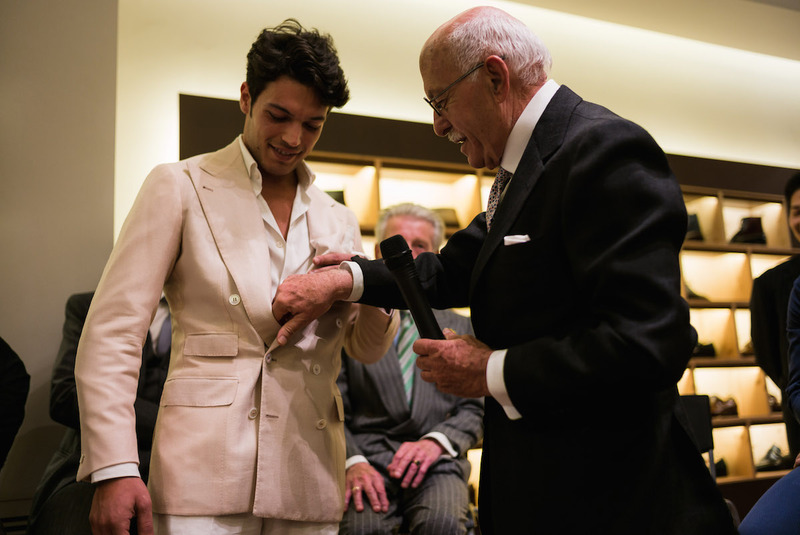 Many thanks to Stefano Bemer and Vitale Barberis Canonico for making the whole thing possible. And to everyone for coming. You can follow the discussion on The Tailoring Symposium: six greats in one room by entering your email address in the box below. You will then receive an email every time a new comment is added. These will also contain a link to a page where you can stop the alerts, and remove all of your related data from the site. Smashing. Very interesting to see. Looking at the audience, it looked like one is back at school, listening agog over the presence of the masters. Looks like an amazing event Simon, can’t wait to see the video footage. Interesting stuff and a good range of styles: although it could be said that they are all very STRONG exemplars of their particular styles. In some ways it might have been interesting to have one of the more traditional (understated?) tailors there, a Poole or Dege, etc..
Incidentally, how long can Edward Sexton go on for? He’s been around for ever. It could be said, apropos of your comment, that Chittleborough & Morgan ahve “looked at and tweaked” his style. Can we also say that we have reached ‘peak’ socklessness? It just doesn’t look good in anything vaguely formal. Simon, it looks like a very interesting event that you put together. Well done! What’s the reason for engaging the mainstream press exactly? Would it not be better to invite i.e. PS/ Rake readers and bespoke devotees to such an event? Can you perhaps explain a little more clearly the main objectives in holding the symposium essentially in private? It’s such a pity that those most interested only hear tiny snippets of the discussion. Thank you for sharing. This was a great initiative! The gathering of those who belong to the best of the best in today tailoring! Amazing! Hi Simon, you need to replace various references you make to Solito in the introduction of your article with Panico. Best! 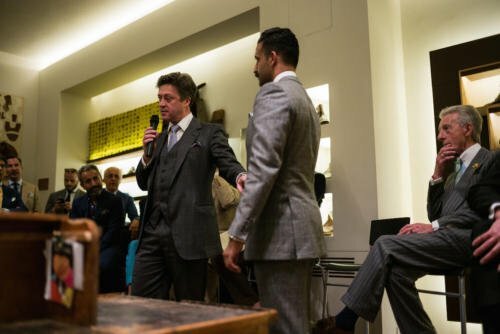 Looks like an amazing event, wish I could have attended – I imagine a lot of the tailors present have fairly limited opportunities to meet each other and there must have been many fascinating exchanges. What shoes are you wearing there Simon? Rubinacci? Bow Tie? Great work btw, wish I could be there. Let linen socks be your friend: Bresciani do a good line. I wear them and like them Mark. No socks at all is always going to be cooler though. Please put some socks on. I can only imagine that most of those posters decrying the sockless look have never lived in hot countries. 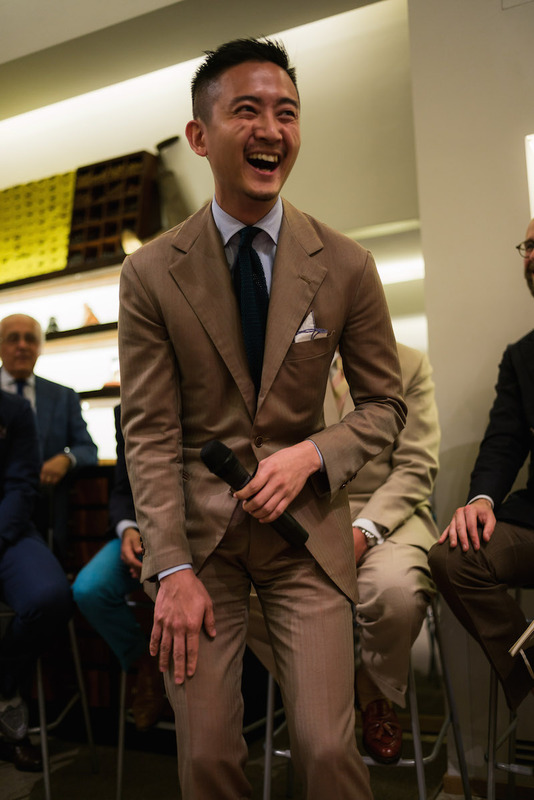 As someone who lived in Rome for many years and now lives in Hong Kong I frequently go sockless, and it is an attractive and comfortable look as long as the tailoring is not too heavy or formal and the shoes are relatively casual. I actually think socks with casual loafers look a bit awkward. It’s also a question of context: what looks good in Naples on a hot day might look a little strange on a grey, chilly day in London (even if it’s midsummer)…. I see your point Mac, a tie is definitely more formal and sockless definitely less formal. I quite like it here though – it is akin to the slippers, which again bridge formal and informal. Well, seeing as it’s you, Simon….No doubt it’s been well considered! Hi Simon, thanks for posting and kudos to you for organising. With such a collection of tailoring wisdom are you able to distill the force of their presentations into a few guiding thoughts and impressions from the evening (forthcoming video notwithstanding). For example Edward Sexton’s observation regarding shoulders, collar and lapels says much (though how this is achieved through tailoring is a further lesson in itself). 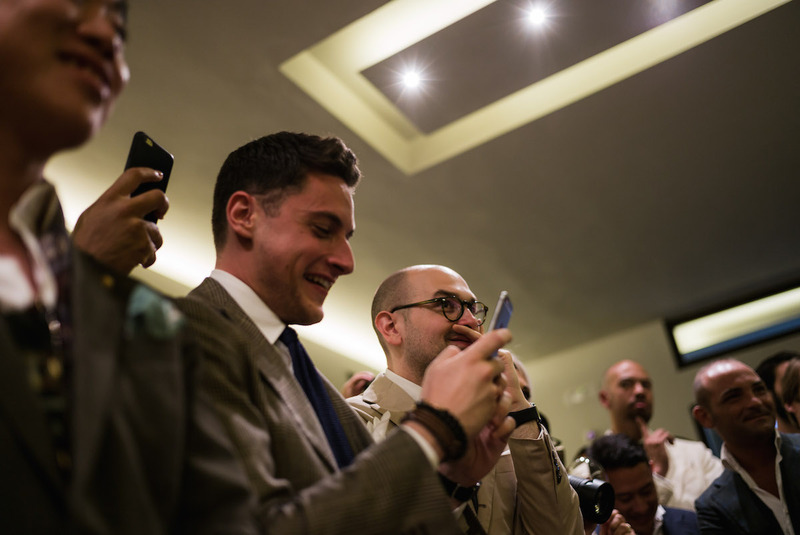 Did you see Simone Abbarchi while in Florence? I am looking forward to hearing more about your experience with his shirts. Also, in general terms do you know whether Panico’s pricing is more similar to Rubinacci/Caliendo or someone like Solito? Looked like a very interesting event indeed. I think you did a great job of selecting the different styles to represent. Do you have any plans on uploading a video of the event? 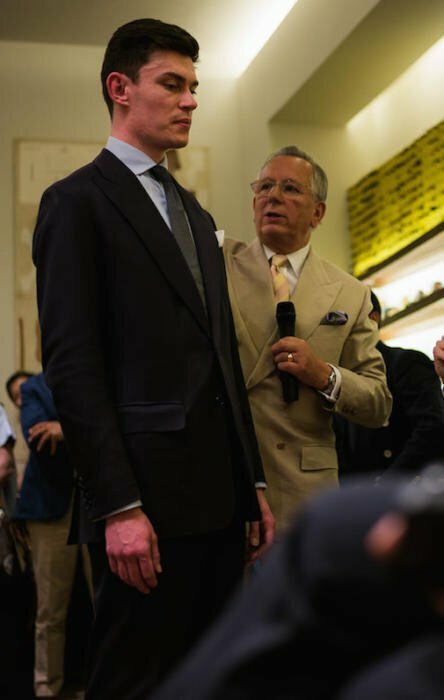 I personally live very far from Europe and would probably never be a customer of these gentlemen but I am very interested in hearing how they describe their styles. Hi Simon, do you know what fabric the 6X1 Lorenzo’s wearing is made out of ? That’ll be great. Thanks. On a side note, would you say a 6X1 made with this flannel would be a decent idea for a first suit — I ask this with the intention of wearing it as both an odd jacket and a suit as required. Not really, no…. Flannel isn’t always great for a jacket, but more importantly this would be a very bold thing for a first commission (colour, DB, and 6×1 rather than 6×2) and I’d be afraid you wouldn’t wear it that much.